Two weeks ago, we joked about a campaign ad using a voice talent that sounded surprisingly alike a certain celebrated actor. Soon after, Jill Bader, communications director for Scott Walker’s campaign, emailed asking us to “please update your post, I would appreciate it.” We agreed. Now, having spoken with the agency that created the ad and the campaign that commissioned it, it’s beginning to look a lot more likely that GOP candidate for governor of Wisconsin, Scott Walker, is knowingly misleading voters by pretending to have the endorsement of one Oscar-winning Morgan Porterfield Freeman Jr.
We finally have attained the ad in question in higher quality than the original post. To date, the “sewage” ad above remains the only Walker ad the campaign doesn’t want to feature at its site. Nonbox, the agency in Milwaukee responsible for the ad, spoke with us and insisted that “there was no conscious decision to use the talent because he sounded like Morgan Freeman, we chose him because he always does a great job of delivering a message because he is a very talented announcer.” Yet, the Nonbox spokesman refused to reveal the name of the talent and despite insisting it uses him all the time, would not direct us to one of the many ads they claim he has voiced. Even off record, purely to confirm the claims, the agency and the campaign refused to provide this information. When I pointed out to both that it was in the interest of the Walker campaign to confirm their claims for our update they stopped emailing us back. 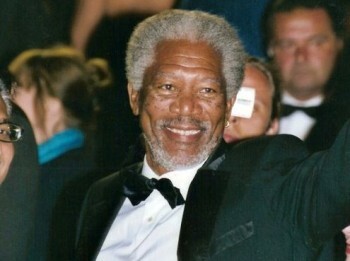 Now we’ve heard that this ad, the one that in no way intentionally featured a voice identical to Morgan Freeman’s, has attracted the attention of the real Morgan Freeman, with his people reaching out to the Walker campaign last week. Completely coincidentally of course, the ad has ceased running.